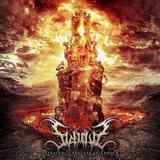 I figure since I opined on the first release by the Brits Sidious, their EP Ascension to the Throne ov Self, then I might as well provide a review for their debut full-length Revealed in Profane Splendour. Actually not entirely composed of UK born musicians, Sidious is more of an international collective with Khrudd (Daniel Neagoe of Colosus and many other bands) drumming for them. Overall, the direction Sidious have taken on Ascension to the Throne ov Self did not change drastically on their latest release. Those who feel “true” black metal should have no commercial aspect to it, please read no further. With their faces slightly painted Sidious do worship dark arts, but do it in the careful, marketable manner, where songs like the title track display dark entity adulation, but only in a clean sort of way, without rawness or red meat thrown at the listener. Skilled instrument playing, and even more meticulously crafted sound and production than on the EP may lead some to call Sidious too clean for their liking (O Paragon, Bringer ov Light). The symphonic aspect in the band’s approach to black metal also increased, Annihilation ov Abhorrent Crescent beginning with a dark choral oratory, before succumbing to lots of blast and atmosphere later. Opener Sacrilegious Majesty begins with an epic wardrum, and revisits the theme on occasion, bringing comparisons to Rotting Christ’s Aealo. There is still darkness aplenty here, but it is certainly not raw and fleshy. The title track manages to contrast epic and grandeur parts with faster more breakneck sections, and Inexorable Revelation is a lot more thrashy and chaotic, but it is also very carefully engineered, so you never get the sense that the band is going bestial and out of control. And then there is also a touch of cold atmospherics, synth in Obscenity ov Old, or a random atmospheric overtone in Sacrilegious Majesty. One facet of Sidious that has changed, and significantly to the better, is vocals. No longer monotonous deathcore growl, Sacrilegious Majesty has them going low and throaty, Inexorable Revelation adds more high-note passion, the title track combines the two in a dual approach, and Obscenity ov Old can be called almost clean. When you want to be scrupulous and particular about your sound, no portion can be overlooked, and I am glad to see Sidious now include the vocals on their list. I stand by earlier assessment that the fans of Dimmu Borgir, Behemoth and Rotting Christ should not be disappointed in Sidious, and if the album’s title is a guide I get both a little bit of profanity and a whole lot of splendor in the band’s latest release.